Okay, I'll admit it... this show is a little absurd. 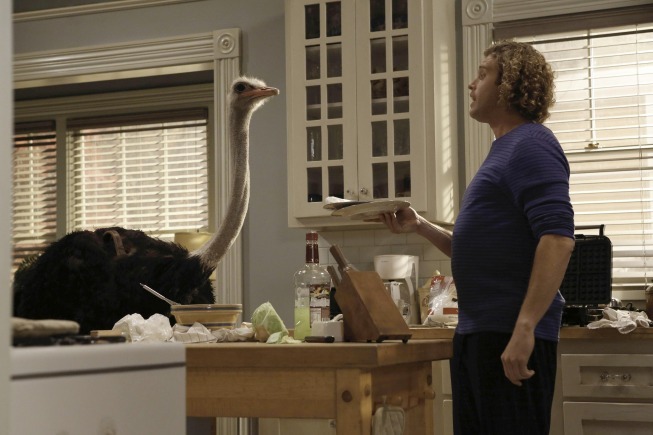 Jimmy's smoothie of vodka, dandelions, coleslaw, and margarita mix was one thing, but repeatedly having ostriches in the kitchen is something else! I have a feeling this is only the start of it, judging by the name of the next episode, but hopefully the birds don't pull down the show too much. I know that's not asking a lot, as it's not exactly the most popular comedy out there. It also didn't help that there was no video this episode, just a "math problem" of sorts. But, I enjoyed finding out that Chloe's good at more than just Morse code... maybe she'll do well in college after all! Fifteen years late is better than never!